Happy Easter to those who celebrate and Happy Passover to those who observe! STAR DOG is excited to announce that we are ready for Pre-Launch orders. Every t-shirt we sell during our Pre-Launch an identical child size one is donated to a child at the TASHIRAT ORPHANAGE. The effects of economic hardship can be felt all over the world. Chances are you have heard of someone that has been touched by the growing economic downturn of recent years, and the predictions are showing no end in sight. With the growing numbers of unemployed, the rising price of fuel and living, and increasing natural disasters many families are doing without basic necessities. Many low income and homeless families are challenged with providing clothes that are the right size, comfortable and free of holes. While families struggle to provide basic needs for their children, new clothes are usually last on that list. 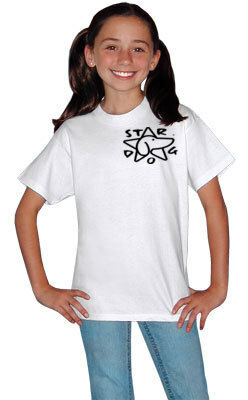 Star Dog wants to build confidence in young people by providing children in need with new t-shirts that make them feel good about themselves. Why Star Dog? There are many companies and organizations that provide food, housing assistance, and used clothing to families in need…but how many actually provide brand new clothing? Star Dog wants to do just that. As adults we know how it feels when we look our best, and sometimes wearing our favorite shirt, or shoes, or our most comfortable jeans reflects positively on our outlook of the day. Kids have so much to deal with these days and the constant need to fit in or even stand out positively in a crowd is EVERYTHING to them! While we realize that NEW clothing is not one of the five basic needs, we recognize its importance to kids! 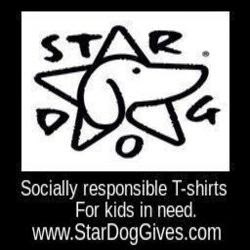 So for every T-shirt you buy, Star Dog Gives one new one to a child in need. Thank everyone in advance for coming along on this journey with us. This is a new business venture with heart and meaning for us. With your support we are sure to be successful in making a diffence in the lives of children. SPECIAL REPORT * Thousands of children go to school in rags. The price can be ridicule by classmates, behavioral problems and academic distress. Some children come to school in their pajamas, others show callused toes poking through tattered sneakers. Two brothers alternated days in class because they had only one pair of good pants between them. Throughout Los Angeles public schools, thousands of children struggle daily with a humbling consequence of poverty: inadequate clothing. At a time when youths strive to keep up with social norms that say what you wear is a statement about who you are, attending school in ragged clothes is often embarrassing and can hinder learning, educators and children's advocates say. The worn-out, torn clothes on their backs is one visible sign of the poverty that afflicts nearly three-quarters of Los Angeles Unified School District students, who commonly come to school hungry and sick. About 72% of the district's 711,000 students come from families living in poverty. Although there are no records kept on how many children lack proper clothing, officials estimate that at least half the students at the poorest schools wear little more than rags or unwashed clothes because mom ran out of quarters at the laundry. The magnitude of the problem is seen at places like Operation School Bell, a Hollywood charitable group that outfits thousands of poor children a year with new sets of clothes. It is seen every year when 5,000 to 7,000 children show up for a "Back to School" shoe giveaway at the Fred Jordan Mission on Skid Row. It is seen at schools like Morningside Elementary in San Fernando, where teachers keep a stash of sweaters for students wearing tank tops during recesses on cold mornings. Although millions of poor children nationwide lack adequate clothing, advocates say the issue is overshadowed by the more urgent needs of hunger and health care, said Julian Palmer, a spokesman for the National Center for Children in Poverty, based in New York City. "But," Palmer said, "millions of children are affected in painfully silent ways, such as inadequate clothing, that diminish their quality of life and opportunities." Inadequate clothing can be one part of a sad equation that leads children to skip school and have behavioral and academic problems, experts say. It can hint at problems at home, including neglect, loss of income by parents and a lack of food. "Usually, kids not having enough clothing is just the tip of the iceberg," said Hector Madrigal, LAUSD's director of pupil services and attendance. "A lack of clothing is like a student that is crying for help." Because 13-year-old Alvaro Perez's parents cannot afford to buy him a new sweater or shoes, he shivers in class on cold days. When it rains, he sometimes misses school because his shoes have holes. The shy, thin boy who lives in a tough Canoga Park neighborhood said he hates missing school and wants to be a lawyer when he grows up. "I want to do something good with myself," said Alvaro, who attends Parkman Middle School in Woodland Hills. "I want to help my mother. I don't want to be in a gang. I try to study, but it's hard because I don't fit in. They make fun of my clothes." His parents struggle with five children, ages 5 to 13. Sometimes they can afford only tortillas for dinner. Family members take turns sleeping on the bed and the floor while using old curtains for blankets. His mother, Candida Vasquez, wishes she could buy her children new clothes and shoes--especially shoes. Her children wear them out quickly. Without a car, they walk to school and the market along unpaved roads and across vacant lots. Once she saved $5 and bought a pair of shoes for Alvaro, not realizing they were girls' shoes. His classmates laughed at him. Alvaro's used clothing and hand-me-downs call attention to his poverty, too: high-water pants, a tattered blue sweater left over from elementary school. At Van Nuys High School, Sara Carrasco, a school liaison between teachers and parents, often hears about students who want to stay home because of their clothes--not because they don't have garments with designer labels but because they simply lack more than one shirt or one pair of pants. "A parent told me [recently] that her son doesn't want to come to school anymore because he only has one pair of pants and one shirt," Carrasco said. "He's embarrassed. His classmates were teasing him." The boy's mother turned to charity, finding a jacket, three pairs of pants and some T-shirts from the school's collection of donated clothes or unclaimed items in a lost-and-found box. Many schools in Los Angeles Unified have similar stashes. On cold days at Morningside Elementary School in San Fernando, Veronica Sosa, a parent volunteer, regularly scans the playground and summons children who are running around in thin or torn shirts. Sosa gives them sweaters and makes sure that they put the sweaters on. "We see a lot of bad clothes," she said.